Wire or wire rope is inserted into a channel in the Gripple, where it is gripped by a spring-loaded roller or wedge, and tensioned by being pulled through. The channel is mirrored on the opposite side of the Gripple, allowing the wire rope to loop through an anchor eyelet and return back through the Gripple for adjustment and Termination under load. designed for use when Terminating 6-20 Gauge (Channel Master 9080) Stranded steel cable used for Telescopic Mast Down Guy Wire. 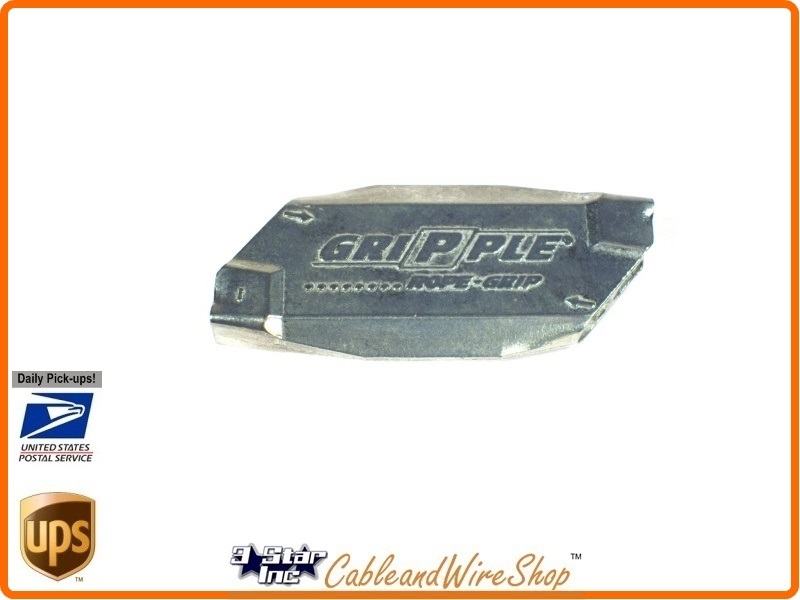 These particular Gripples are made for Stranded Wire Rope as opposed to those made for Solid Hi-Tensile or Barbed wire. Note: To make things really easy when you're erecting a Push Up Telescopic Antenna Mast, after Mounting the Mast on a Ground Plate or equivalent, use two Cable Clamps to terminate each Down Guy on the Mast end through the Guy Rings as intended for this purpose, then thread through the Gripple on the Anchor end. Take the 1st Level of Guy wires (Lower Ground Tube) and by hand you can tension the Gripple ends at all Anchor Points until Mast is relatively Plumb, Tape a Bubble Level to the Mast side opposite each Guy and Tension each Gripple in turn with the TGTP Gripple Tool (relocating the Level as necessary) until the 1st level Guys are tense. Then start Erection by extending the Top-most Tube section with your Antenna, Antenna Lead and Guy Wires attached, Locking it down with the Set Screw nested in the next Section and then repeating with each successive Tube section until fully erect. Start from the Lowest Tube Section, and repeat the Guy Tensioning Process, moving up one level at a time level, until all Guy levels are tense. PLEASE DO NOT THINK YOU CAN SHORTCUT THIS PROCESS. by extending the Mast Fully on the Ground horizontally, and then Raising it, under load, up through vertical and thenguying it down. This will only Crease, Fold or Collapse the Mast to Fail under Load; as NO Mast is designed to erect in this Fashion. A lot of Us are forced to undertake projects with a minimal or non-existant work force. the method prescribed above is one that can be performed solo in the absence of wind, just take your time and do one thing at a time. Safety First!